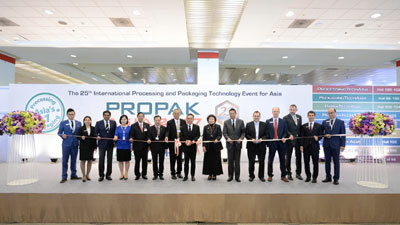 Mr. Panuwat Triyangkulsri, Deputy Director General of Industrial Promotion (DIP) presided over the opening ceremony of ProPak Asia 2017 – the Asia No.1 international processing, filling and packaging technology event featuring a vast array of technological innovations designed to reduce cost and increase energy efficiency. The event is organized UBM BES during 14-17 June 2017. Also attended byMr. Chiruit Isarangkun Na Ayuthaya, Acting President of Thailand Convention & Exhibition Bureau (TCEB), Mr. Patrapee Chinachoti, Chairman of UBM BES, Prof. Dr. Pavinee Chinachoti, President of Food Science and Technology Association of Thailand (FoSTAT),Mr. Justin Pau, General Manager of UBM BES.